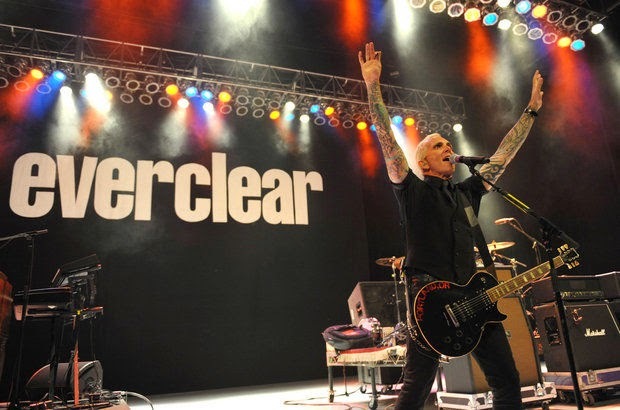 2015 marks the return of Summerland Tour, with Everclear, Fuel, Toadies, and American Hi-Fi, to Uptown Amphitheatre Charlotte on Saturday June 13. Tickets go on sale Friday March 27 at 10am at LiveNation.com, via the Live Nation app, at the Fillmore Charlotte box office, all Ticketmaster outlets or by phone at 800-745-3000. For further details visit www.livenation.com. Presented by Live Nation. As familiar as the sound of a jet engine and as visceral as a ride on a speeding motorcycle, Everclear is heavier, darker and more balls-to-the-wall than ever before. And frontman Art Alexakis has never been happier. and throat of Everclear’s singer, guitarist, cofounder and songwriter. Freddy Herrera, and ridiculously skilled guitar shred of Davey French join forces behind the storm of giant guitar riffs swinging mightily from song to song. A bit of tasteful keyboards from Josh Crawley add atmospheric punch to songs that could crush a tiny dive bar or destroy the cheap seats in the world’s biggest arena with equal force. called “This Is Your Death Song” sugarcoats its confrontational vibe in soaring melodies, delivered with Alexakis’ steady and immediately identifiable voice. “I like the way that trouble rises to the top,” he sings in “American Monster.” “It makes my bitter life a little more sweet.” This album swings. But it also bites. double platinum So Much for the Afterglow produced enduring radio staples like “I Will Buy You A New Life” and “Father of Mine,” as ubiquitous on the radio now as then. A combination of the same classic ‘70s rock that drives Foo Fighters or Queens Of The Stone Age and the melodic punk that inspired Nirvana, Everclear emerged on the pop culture landscape as part of the wave The Pixies and Husker Dü ushered in, a time when abrasive guitars aligned with naked emotional expression to beat back the scourge of vapidity. Everclear shifted the culture alongside bands like Smashing Pumpkins, The Toadies and Weezer; all diverse acts who shared a forceful authenticity. “I’m learning to balance those dark places,” Alexakis says thoughtfully. “I am learning to respect them, but also, to keep them in their place.” Everclear’s frontman is 25 years clean-and-sober, with a wealth of darkness to stare into, but a perspective earned through experience, a healthy home life and a kickass band. Alexakis would write riffs and entire songs alone, then kick them around with fellow California residents Herrera and Crawley. The trio recorded with Carson Slovak and Grant McFarland (who coproduced with Alexakis, who has produced every other Everclear album before) in a studio owned by the band LIVE, with Alexakis tracking the vast majority of the guitars himself for the first time since 2003’s Slow Motion Daydream. French and Crawley came in from the Pacific Northwest to add their flavor to the album, too. The new decade, some life lessons, and 8 years away from the band he helped create and always loved, gave Brett a new desire to re-launch Fuel. Armed with guitarist Andy Andersson, drummer Shannon Boone, and Shinedown bassist Brad Stewart, the new lineup took to the road to reignite “Fuelies”, as their loyal fans are known. Fuel played to packed halls, sweaty rock clubs, and on festivals bills throughout the United States. The “Fuelies” wanted more, and they got it! The songs on Rubberneck are fearless, literate and visceral. Their protagonists are perceived as anti-heroes: stalkers, serial killers and religious zealots (some are all three). Certainly, they’re not your average, accessible radio fodder. Well, the Toadies weren’t concerned about that. “We didn’t even have singles in mind,” Reznicek says. “Or the idea of even possibly getting on the radio. We didn’t think that would ever happen.” But “Possum Kingdom” remains a radio staple even today – and “Backslider” and “Tyler” still pop up. It’s because raw expression makes for the most powerful art. The Toadies remain raw. Vaden Todd Lewis still sings as though he’s on the precipice of insanity, clinging tenaciously but perhaps already plummeting. Lewis’s and Clark Vogeler’s guitars rip and tear like thick fingernails at supple flesh. Reznicek and bass player Doni Blair (who joined the band in 2008) fuel the fury with relentless, seething rhythm. When these sounds and those images and themes mix, the effect is pure adrenaline. The manic, chugging-choogling strains of Rubberneck’s opening instrumental salvo “Mexican Hairless” run pell-mell into the equally breakneck “Mister Love,” a backhanded plea for salvation. The pace slows, a little, for “Backslider,” where a father drowns his nine-year-old son in deliverance. And then “Possum Kingdom,” the Toadies’ notoriously creepy megahit, slows things down again with a dangerous antihero’s offer of a different salvation. Water” – and leaves you satisfied and a little uncomfortable. era – for a new generation. A one-off show in Dallas in 2006 became a full-fledged reunion. The Toadies have since steadily built momentum. A third album, No Deliverance, came in 2008 and saw the band playing Lollapalooza. The heretofore-lost album, Feeler, finally materialized in 2010. A new album, Play.Rock.Music came out in 2012. Tours followed each release. The band’s annual Dia de Los Toadies festival – at which the likes of Gary Clark Jr., Ben Kweller, Centro-matic, Sarah Jaffe, The Sword and Black Joe Lewis have appeared, grows each year. Hairless.” The other rarities, Rubberneck-era live takes of “Possum Kingdom” and “Tyler” are snapshots of a band in original form. forward to in 2014 – including a new album due this Fall. “It’s gonna be our ‘chill set’ that we play on the first night of Dia de Los Toadies,” says Reznicek. “Acoustic, stripped-down versions of our songs. Probably some new songs, some previously unreleased songs and some new covers.” Recording is currently underway with Rob Schnapf, one of Rubberneck’s original producers. And there’ll be more where that came from. Blood & Lemonade is American Hi-Fi’s fourth full length and their first since 2010’s Fight the Frequency. Featuring the “Golden State” and other notables “Allison” and “Armageddon Days,” the record wholly embraces the sound and spirit of classic, balls-to-the-wall, guitar rock mixed with the power pop sensibilities that lead to their worldwide smash “Flavor of The Weak.” Blood & Lemonade was released worldwide on September 16th via Rude Records. In support of the record, the band performed a special one-off at London’s famed 100 Club, which sold out quickly after being announced. The band also performed select shows in Los Angeles, New York City, and Boston in support of the album’s release.